“The Republicans need somebody to stand up. May I suggest George H. W. Bush stand up and tell the people what really happened to him in 1990, 1992. And that George W. Bush stand up and really stop taking the blame for what happened to the economy and put it where it belongs. We need the two former presidents to stand up just like the three presidents today that are Democrats, are bashing the Bush administration. Bashing their economy. They need to not wait for history to tell the story. They need to tell the story themselves. Micheal Reagan is right. If the American public is ignorant to the consistent benefits of tax cuts, how can you expect the public to support them? And, it the Republican Party cannot explain how liberty, and capitalism and limited government is beneficial to all Americans, then conservatives need a different party. The Bush tax cuts created jobs. From June 2003 to December 2007, the economy added 8.1 million jobs, according to the Bureau of Labor Statistics. The unemployment rate fell to 5% from 6.3% . Real GDP growth averaged close to 3% in the four-plus years after that, and the budget deficit fell steadily from 2004 to 2007. And despite Obama’s claim, Bush’s policies did not increase income inequality. In fact, inequality was the same when Bush left office as when he came in. Unfortunately for America, Barack Obama’s ‘Spend your way to hell’ plan did not have similar results. Since Obama took office the labor force has shrunk from 66% to 63% as almost 5 million American adults stopped looking for work. The Bush tax cuts grew the economy and paid down the deficit. During the Bush years, despite the 2000 Recession, the attacks on 9-11, the stock market scandals, Hurricane Katrina, and wars in Iraq and Afghanistan, the Bush Administration was able to reduce the budget deficit from 412 billion dollars in 2004 to 162 billion dollars in 2007, a sixty percent drop. In 2004 the federal budget deficit was 412 billion dollars. In 2005 it dropped to 318 billion dollars. In 2006 the deficit dipped to 248 billion dollars. And, in 2007 it fell below 200 billion to 162 billion dollars. During the Bush years the average unemployment rate was 5.2 percent, the economy saw the strongest productivity growth in four decades and there was robust GDP growth. 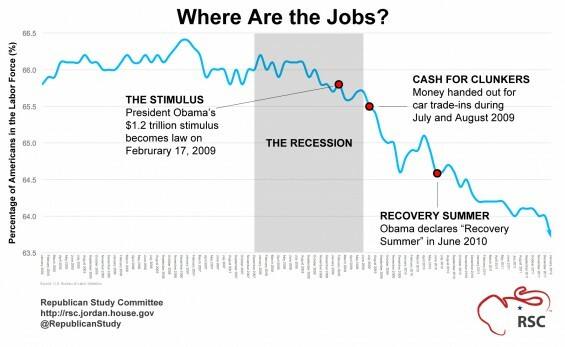 Not only were more jobs lost initially after the 9-11 attacks in 2001 than in the 2008 market crash, but more jobs were created by President Bush’s pro-business policies and tax cuts than by the Obama-Pelosi “spend your way to hell” Keynesian failure. It’s just too bad most Americans don’t know this. And it’s too bad conservative leaders won’t defend freedom and limited government.